Sanrio—Japanese toy company, creator of Hello Kitty, and purveyor of all things cute—has teamed up with Plan Check, L.A.’s popular burger-and-beer mini-chain, to create a special menu based around Gudetama, Sanrio's lazy egg. You’ve got until November 29 to check out the menu by Executive Chef Ernesto Uchimura, found at the restaurants in the Fairfax, Sawtelle, and Downtown neighborhoods of Los Angeles. Plan Check isn't the first restaurant to take this character and turn it into a menu—a Hong Kong café created a Gudetama dumpling that oozes chocolate custard, for example. For $39, diners can sate their appetite with a three-course meal. There’s an appetizer of a crispy blanket egg, soy sauce egg, spicy pork belly sausage and miso aioli, followed by two beef sliders with fried quail eggs—featuring Gudetama’s slightly grumpy face, of course. 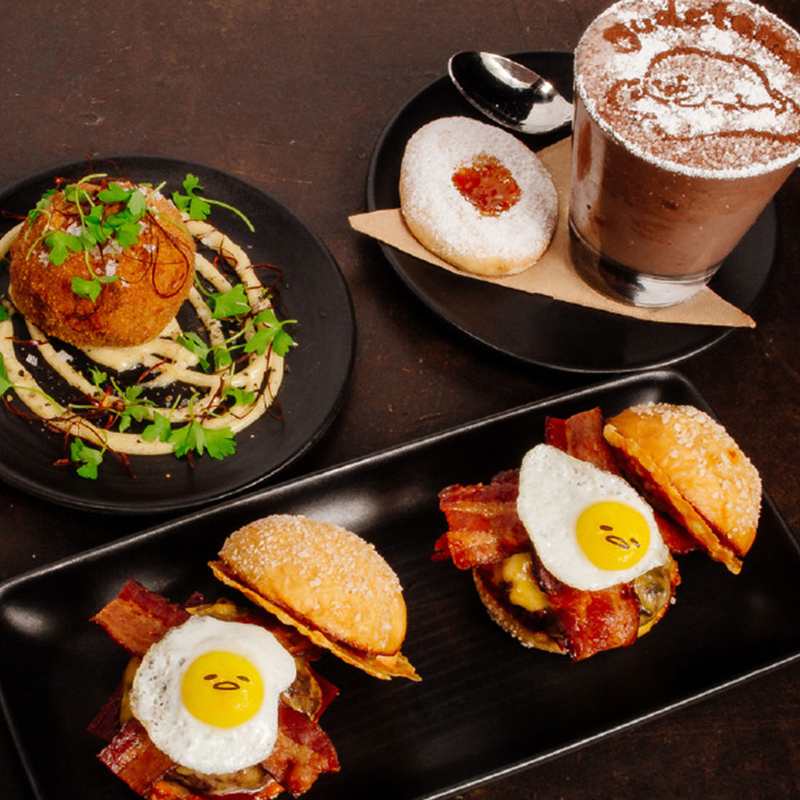 End the meal on a sweet note with a chocolate custard pudding, an apricot thumbprint cookie (that looks like an egg), and orange-ginger egg cream soda topped with Gudetama’s scowly visage. To commemorate the meal, diners get a limited-edition T-shirt. This isn’t the first time that Plan Check has teamed up with Sanrio. In 2014, Plan Check created a Hello Kitty Burger Bento Box complete with house-made pink cheese. And elsewhere in Southern California, a shipping container will soon be home to a Hello Kitty pop-up café. Fans of the Sanrio universe,will be able to choose from treats featuring Hello Kitty, the little frog Keroppi, My Melody, Little Twin Stars, and, appropriately, Chococat on mini-cakes, brightly-colored macarons, doughnuts, cookies and more. Sanrio plans to open a permanent café some time next year.